Here are the best all-inclusive resorts in Roatan, for your vacation in Honduras. All of the resorts offer scuba diving packages and each one has its own charm. For beach goers and travelers looking to be near to the action of West Bay Beach then the Henry Morgan Resort as well as the Mayan Princess Beach and Dive Resort which boasts all-condominium units with full kitchens are splendid choices. For travelers looking for more seclusion along the northeastern shoreline of the island then the Fantasy Island Beach, Dive and Marina All Inclusive is situated on a private island with two private beaches or you can try the Media Luna Resort and Spa which offers everything from standard rooms to two-bedroom master suites along with a pier for snorkeling and scuba diving. When you are searching for a mid-range all-inclusive resort in Roatan that boasts a marina and a private beach then the Fantasy Island Beach Resort, Dive and Marina all Inclusive is a great choice. Located along French Harbour along the northeastern shoreline of the island, the Fantasy Island Beach Resort, Dive and Marina All Inclusive is situated on a 21-acre private island that boasts a tropical landscape with two private beach areas and is within walking distance to Daniel Johnson’s Monkey and Sloth Hang Out. The Fantasy Island Beach Resort, Dive and Marina All Inclusive has a modern Colonial two floor architectural style with 115 rooms that feature a bright tropical interior. All rooms have 323 square feet with a sitting area, a choice of bedding and a private balcony that offers views of the tropical environment or Caribbean Sea. The Fantasy Island Beach Resort, Dive and Marina All Inclusive have two private white sand beaches where you can find solitude and plenty of sand to help you relax. The onsite marina and dive center can help you with a variety of watersport activities that range from snorkeling to scuba diving to kayaking to standup paddleboarding. There are several nature trails throughout the private island where you can spot up to 50 exotic animals and birds. The property is within walking distance to Little French Key, Arch’s Iguana and Marine Park as well as the Pirates of the Caribbean where you will find ziplining. The Fantasy Island Beach, Dive and Marina All Inclusive have a freshwater swimming pool with a swim-up bar and limited spa services are available but there is no fitness center. Dining at the resort includes Restaurant La Palma for breakfast as well as dinner and La Palapa Restaurant prepares a beachside lunch. Offsite dining requires a short taxi ride whre you will find the Pineapple Grill, Romeos Restaurant prepares Italian and Frenchy’s 44. Nightlife at the property is lively with music and other performances in the Lobby Bar or you can venture to Herby’s Sports Bar and Grill to catch a game. If you are interested in an all-inclusive resort in Roatan that is great for all types of travelers including families and offers direct beach access as well as plenty of entertainment onsite then the Henry Morgan Resort is perfect. Located directly on West Bay Beach along the southwestern coastline of the island, the Henry Morgan Resort is situated within a lush tropical environment with direct beach access and is less than 1-mile from the South Shore Zipline. The Henry Morgan Resort is contains twenty seven Meditarrenean designed two story buildings that house 121 rooms and suites that boast a bright tropical decor. Standard rooms are spacious with a choice of bedding and private balcony that offers views of the resort or tropical landscape. One, two and three-bedroom suites as well as villas have more living space with a separate living room; some units have a kitchenette, multiple bathrooms and a private balcony that sports views of the gardens, pool or the Caribbean Sea. The Henry Morgan Resort has a great place on West Bay Beach where you will find plenty of activities that range from lounging to swimming to beach volleyball to watersport activities and there is the Gula Gastrobar for food as well as beverages. There is a fulltime entertainment that offers organized events throughout the day for adults. The Henry Morgan Resort is nearby to many attractions such as less than 1-mile to Gumbalimba Park as well as the Roatan Rum Company and you are 4-miles to the Carambola Botanical Gardens and Trails. 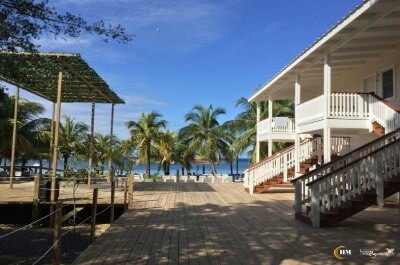 The Henry Morgan All Inclusive Resort In Roatan has two freshwater swimming pools including one with a view of the Caribbean Sea and a snack bar. 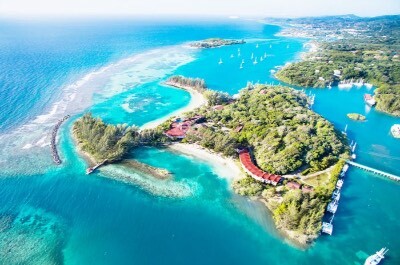 The Henry Morgan Resort has a dive center, fitness center, boutique and a full service spa. Dining includes two restaurants where you will find all three meals buffet style at Barba Nera and ala carte service for lunch as well as dinner at Gula Gastro Bar beachside. Offsite dining is plentiful in the West Bay Beach area with Celeste’s Island Cuisine for Caribbean delights, Nice ‘n spicy serves Italian and the Argentina Grill prepares steaks. There is plenty of nightlife onsite with live performances, fire dancing, karaoke nights and live music in the piano bar area. When you are interested in finding an all-inclusive resort in Roatan that offers condominium style units and is perfect for families looking for plenty of amenities onsite, then the Mayan Princess Beach and Dive Resort is superb. Located along the southwestern shoreline of the island along West Bay Beach, the Mayan Princess Beach and Dive Resort has a lush tropical landscape with direct beach access and is less than 1-mile from Gumbalimba Park. The Mayan Princess Beach and Dive Resort is composed of numerous Mediterranean two-story architecturally designed buildings that contain 60 condominium style accommodations that feature a bright contemporary beach interior. All units at this property have a full kitchen with a breakfast bar as well as a private balcony that offers views of the gardens, pool or Caribbean Sea. One-bedroom Beachfront and Garden villas range in size from 750 to 950 square feet with a choice of bedding options as well as a separate living room/dining room. One-bedroom Tower villas have 1,100 square feet with a separate living room that has a sofa sleeper and a dining room. Two-bedroom Junior suites have between 1,220 to 1,390 square feet with a separate living room that contains a sofa sleeper, dining room and 1-bathroom. Two-bedroom Master suites are size at 1,480 square feet with a separate living room, dining room and 1-bathroom. The Mayan Princess Beach and Dive Resort has a nice place on West Bay Beach where you will find plenty of sand to lounge at the Beach Club San Simon that boasts food and beverage as well as watersport activities that range from swimming to kayaking to scuba diving lessons. The Mayan Princess Beach and Dive All Inclusive Resort In Roatan is close to many attractions with a 2-mile drive to the Rusty Fish and less than 5-miles to the Maya Key as well as the Dolphin Encounter. The resort has a 250-foot freshwater swimming pool with a nice sundeck, a dive center, gift shop and full service spa. There are four restaurants onsite for dining that include the Balam Buffet Restaurant for all three meals; Calkett’s for Italian in the evening; the Beach Club San Simon serves lunch as well as dinner and the Luna Maya prepares an ala carte menu of international specialties. Nightlife is abundant onsite with nightly performances that range from live music to fire dancers to karaoke at one of the lounges. If you are seeking an all-inclusive resort in Roatan that has a lively atmosphere and offers plenty of activities including scuba diving, then the Media Luna Resort and Spa is ideal. Located 3.5-miles from Little French Key on the northeastern shoreline of the island, the Media Luna Resort and Spa are situated within a lush tropical landscape directly on a white sand beach along Caribe Point at Jones Ville. 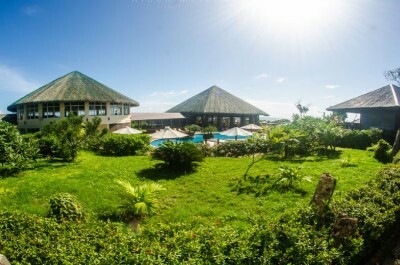 The Media Luna Resort and Spa is composed of several one and two floor buildings that house 110 rooms as well as suites that feature a contemporary decor. All rooms and suites offer a private balcony with a hammock and a garden or sea view. Single rooms are the smallest with a choice of bedding while double rooms have more living space and a choice of bedding. Two-bedroom suites have a separate living room, 2-bathrooms and a Caribbean Sea view. The Media Luna Resort and Spa has a perfect spot on the beach with plenty of watersport activities available including complimentary use of kayaks and there is a pier for snorkeling as well as scuba diving. There is a dive shop onsite that can arrange other watersport adventures and there are several hiking trails for land based jungle fun. The Media Luna Resort and Spa All Inclusive Resort In Roatan has a fulltime entertainment staff that features organized activities throughout the day. The Media Luna Resort and Spa is within 3.5-miles to many attractions including Daniel Johnson’s Monkey and Sloth Hang Out, Big French Key as well as Arch’s Iguana and Marine Park. The Media Luna Resort and Spa has two freshwater swimming pools including a children’s pool, a fitness center, dive shop, an arcade room and full service spa. Dining at this all-inclusive resort includes two restaurants serving all three meals that include buffets and ala carte service. There is also a snack bar and wine cellar onsite. Offsite dining requires a drive or taxi ride to Chez Lola or Temporary Cal’s Cantina. Nightlife onsite is abundant in the theater with live performances each evening and there is live music on selected in the lounge area.